If you read Inspired Economist, you’re well aware that our economic model based entirely on Gross Domestic Product (GDP) is flawed and is driving us over the edge of a cliff. Growth, traditionally, has been measured only by transactions. The more transactions worth more money, the more the gross domestic product, the better. But of course, that’s come with a price. “The only thing that has slowed down the relentless rise of carbon emissions over the last two decades is recession,” and clearly that’s not the answer, says economist Tim Jackson. “It’s a dilemma of growth: we can’t live with it, we can’t live without it. Trash the system or crash the planet. The best avenue of escape for this [we think] is a blind faith in our own cleverness.” In other words, some technology will come along and make everything better. But we need a reality check, according to Jackson. Imagine a world, he says, in 2050, with 9 billion people, all aspiring to western lifestyle. In order for us not to hit global ecological calamity, we’d need a 130x improvement in carbon intensity (a measure of economic output per amount of carbon emitted). he says the role of investment, which typically accounts for only about 1/5 of the economic activity in most modern economies, is one major key. How does our desire for novelty (new stuff) give us an opportunity to invest in a better tomorrow? Further, how is it possible we don’t do the things that make “perfect economic sense” like insulating our homes, buying energy efficient appliances, and the like, that save us money and save the environment? “Are we just novelty seeking, hedonistic individuals, or are we, sometimes altruistic individuals?” How do we reorganize our economy to *CATER* to and feed the altruistic, rather than feeding the hedonistic? 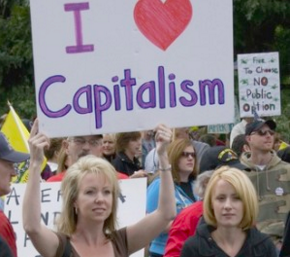 Hint, it’s not about overthrowing capitalism, just reinventing capitalism. Check out the video below to find out more. He closes with another reality check. Bringing it back to the 2 billion people around the world that are living on less than what it costs for a skinny latte at the cafe down the street, he says, what can we offer them in this new growth model? Jackson was asked in an interview later if he could see politicians around the world buying into his argument about a new way to measure growth, and while he didn’t point to Bhutan’s Gross National Happiness, he did indicate that politicians are locked into the old model of thinking about the economy, but he does see the day coming where they change. Here’s a link to the TED talk.